The M-240E Troubadour is an homage to Guild’s F-20, a small-bodied wonder that became popular during the folk era of the '60s. This petite guitar is ideal for fingerstyle playing and light strumming. The reduced size is excellent for smaller players or musicians looking for a great-sounding travel guitar. The M-240E Troubadour features a solid Sitka spruce top over an arched mahogany back, a classic wood combination that produces a well-balanced voice with plenty of overtones. 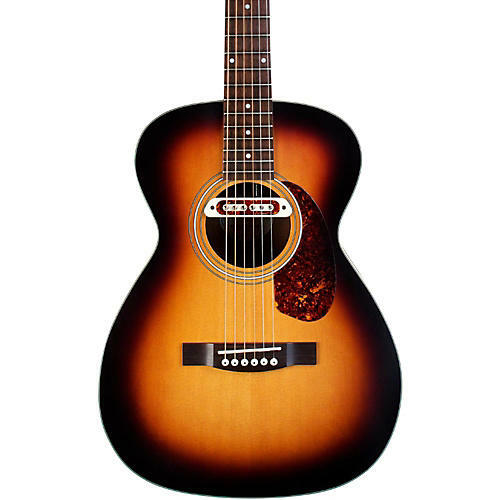 Other features include an Indian rosewood fingerboard and bridge, compensated bone nut and saddle, tortoiseshell pickguard, nickel-plated open gear tuners, and a thin, resonate satin polyurethane finish with a vintage sunburst top. Completing the Troubadour’s vintage vibe is the DeArmond Tone Boss, a user-friendly humbucking magnetic soundhole pickup with built-in volume control that is compatible with any amplifier. A deluxe padded Guild gig bag is included.